If we succeed in awakening the system of our interconnections, we’ll start to understand and agree that we must be connected, included in the law of nature—mutual guarantee, full interconnection of all parts/souls. This is the law of a healthy organism. waiting for it to awaken us “in due time” (Beito). Life is connection between elements, entry and exit of energies, exchange of substances, and in the system of our interconnections—it’s exchange on the level of desires. One can’t rise to any spiritual degree without revealing savage desires inside and going through them the wrong way. Burning with shame, you gradually understand that it wasn’t you who did it—it was the Creator, and you thank Him for revealing the evil. All Israeli holidays are milestones on the path of the Soul’s correction till the final correction. Hence, the holidays speak about the history of the nation of Israel, composed of breakages and corrections. Desire can’t be corrected without revealing its breakage. The holiday of LagBaOmer symbolizes unity, unification. Essentially, all Israeli (Isra-El – straight to the Creator) holidays indicate greater unity (correction) or fragmentation (breakage) between us. The way to check for correct progress is to shift the focus from yourself to the group. At the convention, turn on the aspiration to dissolve, as if you don’t exist, feel everyone except yourself, forget yourself! If we aspire to this, we have a chance to feel the upper force! Thus we unite the hearts/desires and become filled by the quality of bestowal and love. We need to arrive at the convention with great hopes that for the first time in our lives, we can reveal the upper world in the connection between us. In its unity, the group of convention participants becomes a mother’s womb for me, in which I’ll begin to develop as an embryo! Since the world’s correction lies in its proper unification of HaVaYaH, the convention—a world gathering of Kabbalists, people aspiring to attain the goal of creation—is a source of the power of unity, capable of drastically pushing members of Bnei Baruch to revelation of the Creator. We need to prepare for unity, become included in everyone, rise above our ego, feel everyone instead of ourselves—and inside this, to feel the spiritual state, the Creator. Let’s try to make this effort during the convention! Like a floodgate, there’s no way back. This is the path of gradual exit from egoism, the nature I’m completely immersed in! The path of pain is when I can’t relate the pain to the group and the Creator inside it. If I relate disturbances to unity and the Creator, it’s the path of correction. Unpleasant sensations must leave their mark on us, lest no revelation takes place, just like any work or energy is only revealed through resistance. And our unity is built only on resistance, the shattering of the Soul that happened beforehand. There’s one goal in spiritual work. There’s none else besides Him! Everything that happens, happens in order to give us a chance to correct our desires. All #worries, #fears, uncertainties, feelings of helplessness, disorder, personal #problems, whether in family or society—can be resolved only by coming closer to the Creator! We must see the evil that’s revealed as an invitation to correct it and to come closer to each other, until in our connection we will reveal, more and more, the upper force, the Creator. This is how our broken desires manifest, as problems. By correcting them, we build the Soul. Disturbances are the Creator’s actions, compelling us to connect to Him. One should see himself as fighting an inner #war against himself. Then nothing will confuse us, lead us off the straight path, away from the understanding that everything comes from the Creator, His desire to bring us closer to Him. It seems to man that correction is hard and confusing, until he realizes that one need only recognize the defects and ask for their correction. There’s no need to think HOW they’ll be corrected, but only to picture the corrected state, desire it, and ask the Creator. 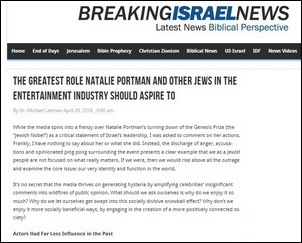 While the media spins into a frenzy over Natalie Portman’s turning down of the Genesis Prize (the “Jewish Nobel”) as a critical statement of Israel’s leadership, I was asked to comment on her actions. Frankly, I have nothing to say about her or what she did. Instead, the discharge of anger, accusations and opinionated ping pong surrounding the event presents a clear example that we as a Jewish people are not focused on what really matters. If we were, thenwe would rise above all the outrage and examine the core issue: our very identity and function in the world. The cascading of the worlds from above downward was the preparation for the correction, and the opposite process from below upward is its implementation. During the cascading from above downward all the conditions were established for disparity of form, so that we would reach the equivalence with the Creator from this disparity. The end of correction is complete equivalence between the created being and the Creator. My Comment: On one hand, here is another example of the irresistible impact of the environment on a person. On the other hand, I always avoided societies where everyone thinks the same. After all, it is a gray mass that doesn’t give anything. It is impossible to develop in it. Worse yet, the leveling of people breeds fascism. Why should I be like everybody else? On the contrary, everyone should strive for individual development. Don’t try to be like others, express yourselves as much as possible. Then everyone will differ from each other, and everyone can bring something special to society, a “prominence” that is found only in you and not in others. The problem is that we do not have a common methodology, a general knowledge, which allows us to build a cohesive society from uniqueness. People should change. They should all be very different and at the same time strive for a single goal. This is a clear development of opposites on their union in a single, common source. It governs humanity in order to eventually elevate each person in his desires to the upper level. This is the program of development of each of us individually and all of us together. According to this program, there are an immense number of commands that descend on us all at every moment. We receive and perform some of them instinctively, and some semi-consciously or consciously. Many of them we miss, are unable to perform, but nevertheless they pass through us in a certain way, forming and developing us. Someone dies in sufferings, and someone wins millions or just lives his whole life without seeing or feeling anything bad in it. Why is it so? The fact is that we do not understand the work of the upper “computer.” The wisdom of Kabbalah explains it; however, really comprehending and grasping this program is possible only by ascending to the system of governance. We need to study the upper system of governance very seriously. It astounds with its uniqueness, its logic, its absolute interconnection and harmony. Getting acquainted with it, a person feels great pleasure because it fills him with greatness and perfection. Then the very concept of “luck” also changes. For Kabbalists, “luck” is that they discover the future world, their future states, and bring their approach closer. The wisdom of Kabbalah is needed exactly for this. It says that there is no afterlife, that everyone should receive and master his future world now, in this life. We live in the lowest, “dullest” of the worlds—until we reveal in it the upper world of love and bestowal. One cannot get there based on luck. There are no favors, lotteries, or accidents. Each person should search, make efforts—and his reward will not be dollars, but the degrees of an exciting spiritual ascent. Regarding this ascent, everyone is equal and no one has advantages. In the wisdom of Kabbalah, everyone has the facts. What Was Man Created For? Baal HaSulam, The Writings of the Last Generation: This is because in fact, there is nothing more natural than coming into contact with one’s maker, for He has made nature. In fact, every creature has contact with his maker, as it is written, “The whole earth is full of His glory,” except we do not know or feel it. Such contact exists all the time. It comes from the Creator and not from creation, and our task is to start feeling it. This is the wisdom of Kabbalah. 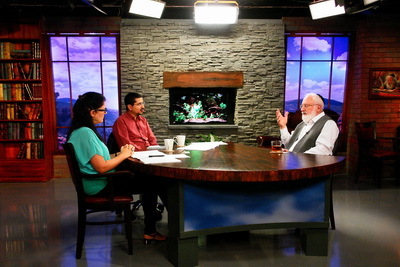 By definition, the wisdom of Kabbalah is the revelation of the Creator to man in this world. The revelation is only in sensations. Question: So, “the whole earth is full of His glory” comes from the Creator, and “we (the creation) do not know or feel it”—from our side? Answer: Of course, every bug, every insect and leaf—everything is directly managed by this force, this field, called the Creator. But this is not given to us in our sensations. Nature is an objective reality given to us in sensations. Therefore, what I feel is what exists, and what I do not feel does not exist for me. I can acquire additional senses and then everything that I can feel in them will also be part of nature that manifests in relation to me. Question: Does a Kabbalist have the ability to constantly control his perception of reality? Answer: There are no people living on Earth who cannot do this because we are all moving toward an ever-increasing correction. And when we become included in the Creator, everything will become simpler. We are facing the need for an absolute change, an innovation in human education. We are disconnected in every facet of life. Education needs to rebuild each person in order for the family unit to survive. We can only be educated in this way through exposure to a new type of environment that will provide a good example to us regarding relationships and social life. This environment will show each person how to get to know and understand his true nature, what life can be like, and how to get there together.